The Microsoft .NET Framework was developed as a platform to make it easier and quicker for programmers to create applications and provides a common set of functions to help make this possible. A lot of PC users do not like .NET anywhere near their systems but with so much more software these days being developed using it, ignoring .NET completely is becoming increasingly difficult. Even thought it isn’t small to download or install, .NET isn’t exactly going to eat up all you hard drive space either and Raymond did some testing a while back to see whether version 4 of the framework would cause the system to slowdown at all. Something that annoys me quite a bit about .NET these days is the shear amount of Windows updates there seem to be for it. Even if you install Windows 7 Service Pack 1 which has version 3.5 pre installed, probably a quarter (or maybe more) of the total updates needed to get the system patched and up to date are for .NET. What’s worse is you will install maybe 2 updates for .NET and when you check for updates again, there are another 8 for it. Check again and there are another 5 etc. etc. It’s pretty frustrating stuff. With the size and complexity of the .NET framework these days, it comes as no surprise that issues relating to the installation, updates or the running of the framework itself are not uncommon. 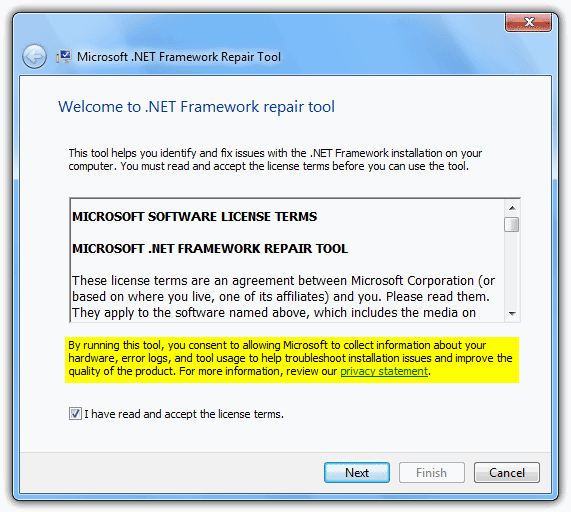 Microsoft themselves have a utility to help detect and repair some of the more common issues faced by users when there is a problem with updating or installing the .NET framework. 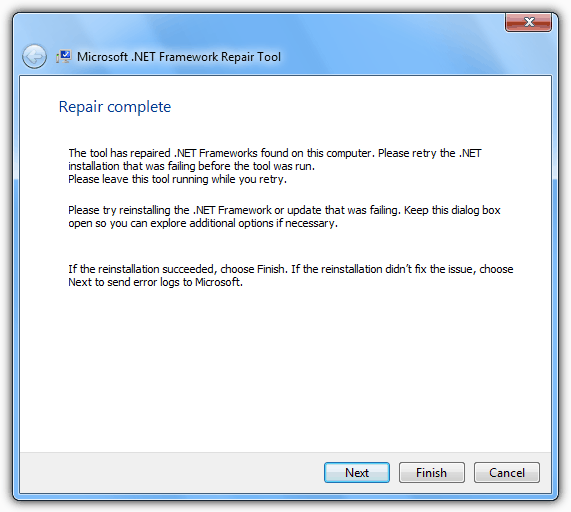 The .NET Framework repair tool is designed specifically for .NET version 4 and can also attempt to repair corrupt installations including the language packs. It can be used on everything from XP Service Pack 3 up to Windows 7 Service Pack 1 and is a standalone executable. The license terms screen informs you that the utility will collect various bits of information about your system and log any errors that were found. If you allow it later on, this information will be sent to Microsoft. Click Next and it will run 9 different tests and analyze the system for .NET related problems. After a few seconds, a window will present you with the findings and what fixes it suggests might help. The common generic recommendation is usually to reregister the Windows Installer service and then restart it which might help, and could even fix other problems related to the installer service almost by accident. 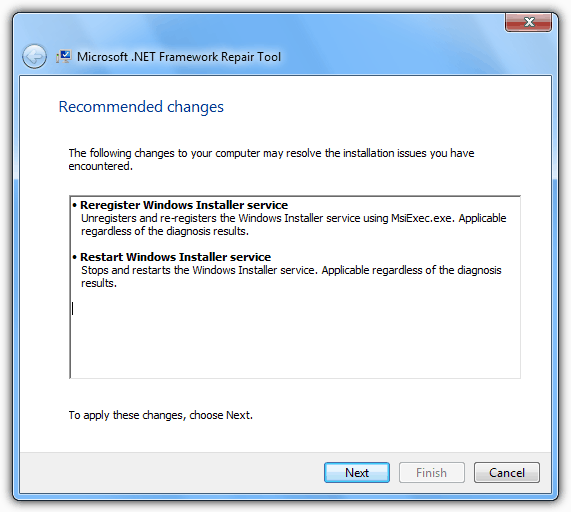 If you click Next to apply the recommended fixes, the repairs will be applied and you will be presented with a screen telling you to try installing or updating .NET to see if the error you had still occurs. If the issue is resolved, click Finish. 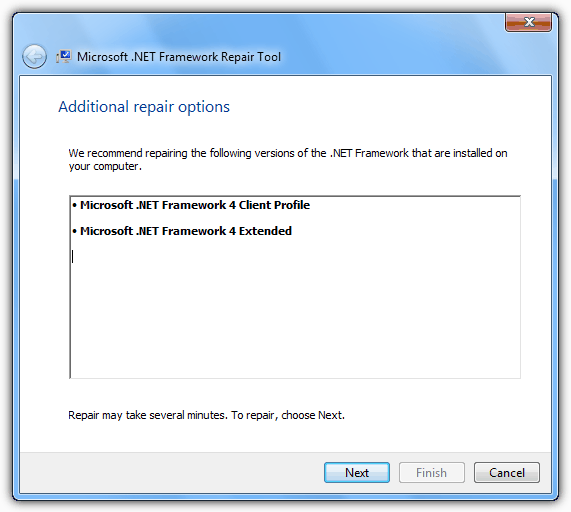 If the problem persists, click Next and there will be the option to attempt a repair of the whole .NET framework. As you might expect, this repair will take a few minutes to complete. Once done, the repair tool will have done everything it can to try and sort the problem. If it failed to resolve the issues, you can click Next if you decide to send the collected information to Microsoft. If not, or.NET now functions properly, simply click Finish or Cancel. i’m so greatful, i wish i had known this site for so long. now my .net problem is completely resolved. There is an update of the tool available: Version 2 supports the .NET Framework 4, the .NET Framework 3.5 SP1, the .NET Framework 3.0 SP2, and the .NET Framework 2.0 SP2. Why only .NET 4? I currently have a problem with three updates for .NET 2 repeatedly being offered on one of my machines and alleged installed (they are NOT installed, incidentally, just creating temporary files only) and I can find no answer, having tried all offered solutions from forums, etc. Just for the record, they are KB2604092, KB 2656369 and KB2686828.